So you want to grow some out of season plants, but you don’t have a lot of room. It’s mini greenhouse (also known as a cold frame) time, and fortunately there are a lot of options to choose from when it comes to construction materials and type. If you’re not too handy with a hammer, a very basic project may meet your needs just fine, while advanced players can explore larger and more complicated structures. There are, however, some cautions to be aware of before you get started. All that desired moisture and heat can also make a breeding ground for fungi and other problems, so you need to make sure to water greenhouse plants directly at the soil level, using a system like drip irrigation (which you can improvise with a drip hose or some PVC pipe) instead of overhead spray. Make sure you have good ventilation, and keep an eye on temperatures, because if your greenhouse gets too hot, your plants will be very unhappy. Your mini greenhouse can be covered in painter’s plastic if you don’t want to spend the extra money on greenhouse plastic, or you can use a non-woven heavy fabric known as Remay or Agribon. This fabric cover allows moisture to wick through to the plants below while providing shade and insulation from temperature extremes. Using clips, you can change your cover depending on the season or remove it entirely if the weather is fair. The same frame concept can be extended, for people with more carpentry skills. You could build a structure tall enough to stand or kneel in, with more room for plants and space for sprouting tables and supplies. Be sure to check with local building regulations; usually structures below a certain height don’t require permits and inspections, but if your mini greenhouse starts to reach macro size, it might need to comply with some municipal or county regulations. 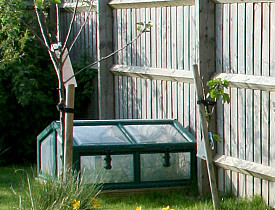 Individual plants can be shielded with a mini greenhouse of their own using very basic measures: Use sticks or poles to create a frame and drape it in plastic or fabric. You can also use something like a tomato cage or used piece of fencing. In all cases, make sure the greenhouse material doesn’t touch any of the leaves of the plant, because it could breed mold. Finally, Batist suggests building a sun porch or lean-to on the side of your house. This requires more planning and work but can result in a useful mini greenhouse that also enhances the value of your home. For basic structures, use a frame of lightweight wood and rigid plastic. If you want something more durable and attractive, install panes of glass, but make sure you’re prepared to handle a bigger construction project. Glass requires much more care and support during construction because of its weight and fragility. If you'd like a professional to handle your greenhouse project, find a reliable carpenter near you.